It is important to fully appreciate that the banking system sees the world differently than most business models. This stems from the basic underpinnings of how banks do their accounting. 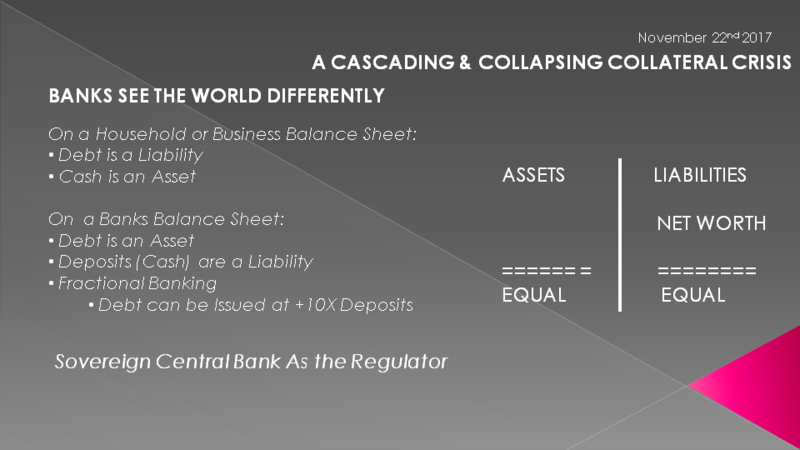 Non-bank business see their financial balance sheet as containing Assets and Liabilities where debt is a Liability and Cash is an asset. Banks on the other hand account for Debt as an Asset and cash or Deposits as a Liability. This makes sense for banks as their prime asset is creation of debt while cash deposits of their depositors are liabilities that must someday be returned. In the old days it was returned with interest on those deposits - not so much today! The world of Fractional Reserve banking which evolved from the dubious practice of "Gold Clipping" was basically a formalized approach to this practice when people shifted to exchanging paper notes instead of gold for trade. To keep things on the up and up bank regulators were put in place to police banks to keep prescribed Reserve Ratios in place. Historically they used to be 10-1. Banks could only lend out ten dollars for every one dollar of deposits. That isn't the case anymore as banks have cleverly had rules & regulations steadily changed, but we will leave that for another discussion. The quasi government Federal Reserve is responsible for enforcement of the banks who solely sit on the boards of the regional Reserve banks. No obvious conflict of interest here! We will assume everything is on the up and up, though we learned during the 2007 Financial Crisis this just wasn't the case with the Too-Big-Too-Fail banks. This prompted numerous national mortgage suits and the creation of the complex Dodd-Frank legislation now by the way being quietly dismantled. Again we will leave this for another day. Instead, I want to move to the murky world of International Banking where there are no regulators. There are Bank of International Settlements banking recommendations and Basel Accord Agreements by the banks, but no one policing, enforcing nor investigating this global banking world. I am not trying to suggest anything is obviously wrong here, just pointing out the frank reality. On the left we see what we do know. A US Bank practicing banking as we are told it works. Of the $10 that is lent out for every $1 deposited we see that a depositor may deposit that borrowed dollar in a foreign bank. Individuals may not do a lot of this but corporations and financial institutions do and since the advent of Globalization in a dramatically expanded fashion. Trillions of dollars as a matter of fact! 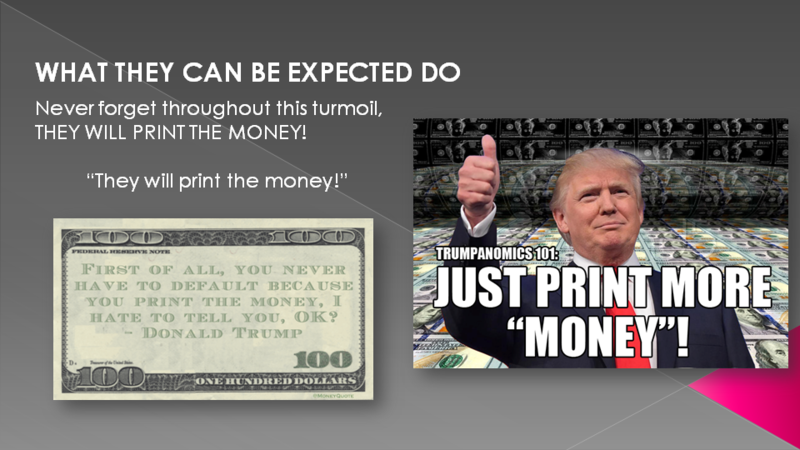 Once that money is deposited in a foreign bank it becomes a bank liability for that bank but then allows them to create $10 (or more) to be lent out. China for example allows over 20:1. You can see how $1 can multiply quickly and exponentially. This is one of the reasons for explosive globalization and why giant global emerging mercantile players such as Japan and China had the money for expansion. 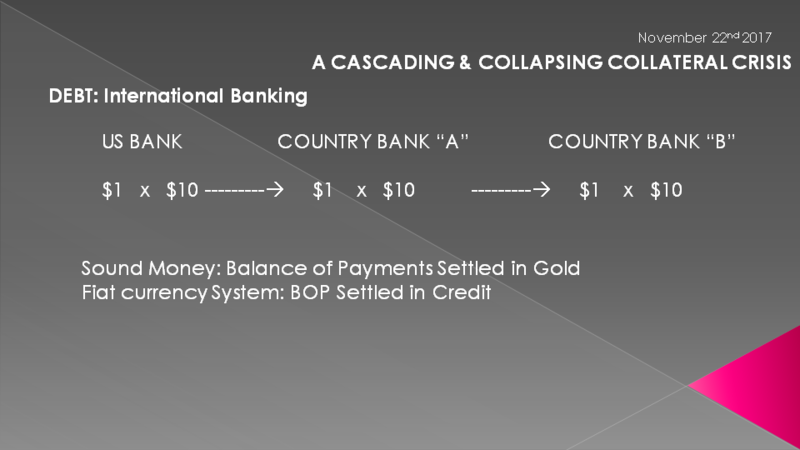 Since coming off sound money and the gold standard in 1971 and adopting a Fiat Currency regime, International Balance of Payments, which previously settled in gold, now settle international payments with credit. 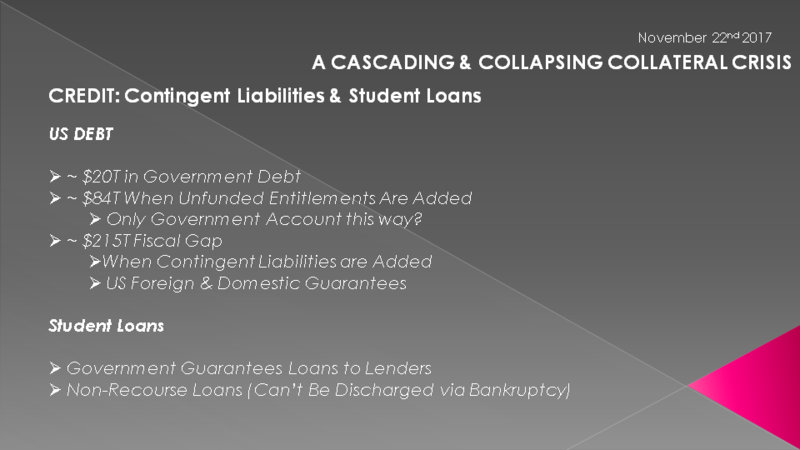 The only impediment to explosive and endless debt growth is the reality of the lending. Lenders normally want assurance they will get their freshly created money back and as such have historically demanded collateral be posted to secure the loan. There in lies the rub. Do these countries have the wealth to secure these loans? If the money is for a power generation plant, lets say in Indonesia, then the plant and government tax assurances could be used. This was the world of the late 70's and 80's. Quickly banks wanted to expand lending even faster. But where was the collateral for it to come from? 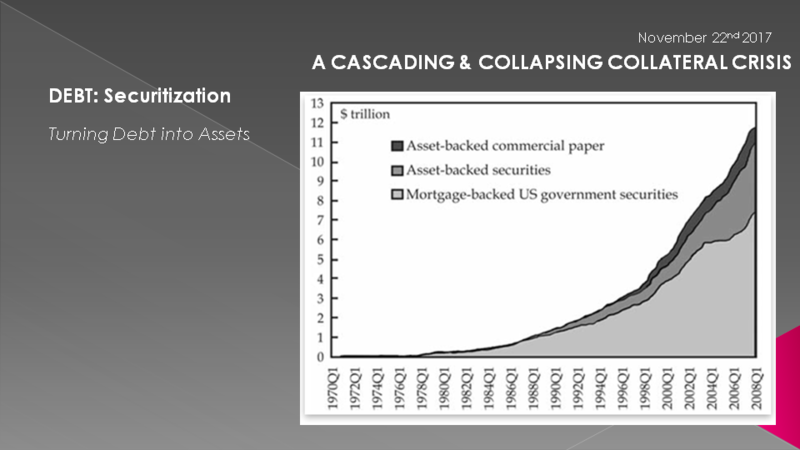 In the US the domestic banks solved this growing problem through the creation of securitization. 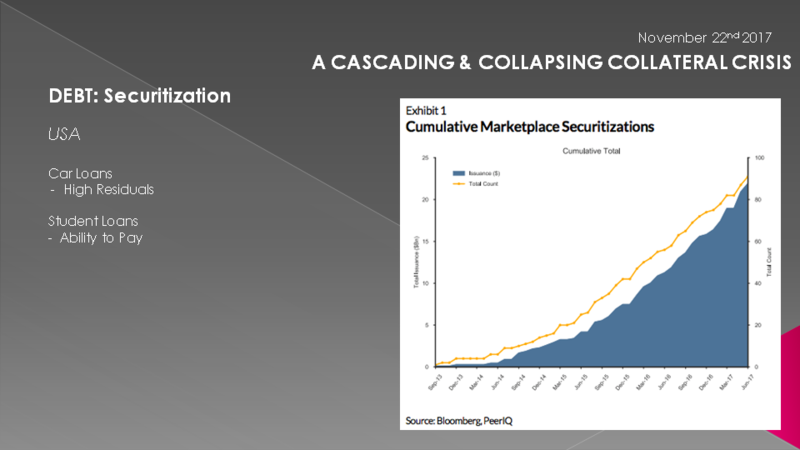 Securitization turns a stream of debt payments like mortgages, car payments, business accounts receivables into an income generating asset! It exploded in the US and is a basic building block of the massive US debt edifice and at the center of the 2007 Financial Crisis. But lets get back to the International Banks. What did they do to create the collateral to spur lending? Well obviously they "sold" the securitization products to other countries where they were both treated as deposits to create lending but also as collateral from none banks to secure loans. But this still wasn't enough! 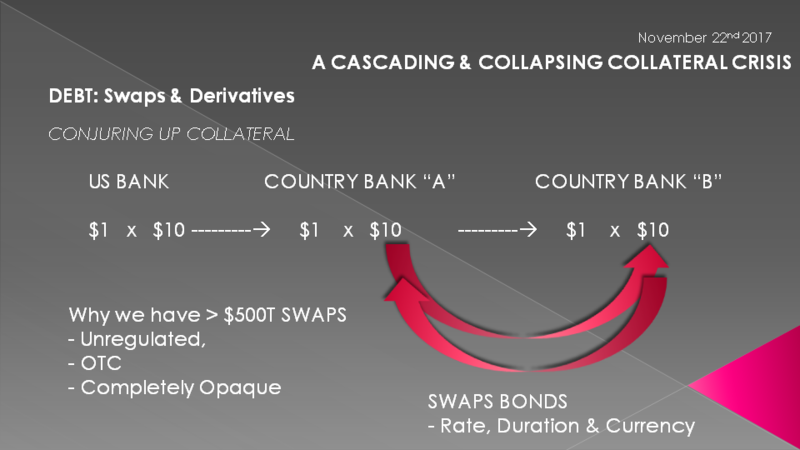 What they then did is conjured up a concept called Swaps using such new legal terminology as "Novation" and "Rehypotheation" whereby a business or government entity with a Bond in one country could swap it for an equivalent valued Bond in another country, adjusted for interest rate, duration and currency. This slight of hand has fostered a $500-$600T dollar global swaps market supported by a global economy of only ~$74T. To even a "newbe" this seems questionable. But who is to question it? 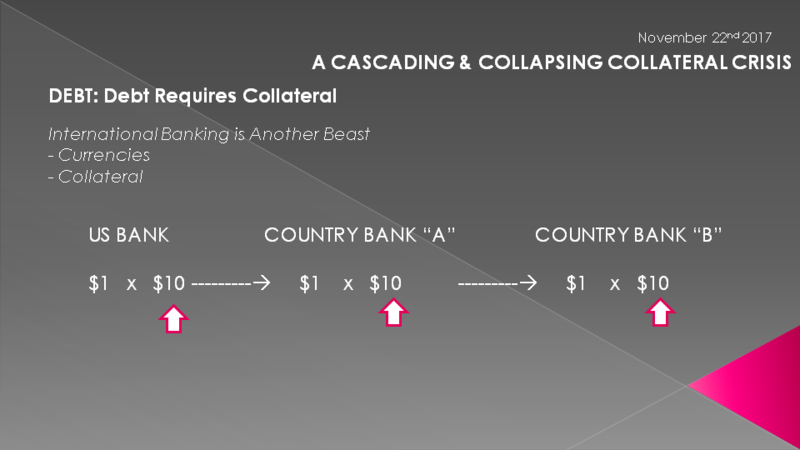 There are of course real economic advantages for international corporations and financial institutions to do this, but the real value here is that banks can use the same bonds for collateral in multiple countries! 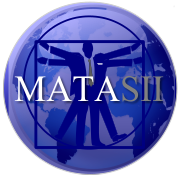 Presto, instant collateral - that is as long as everyone can and does fulfill their agreements. The global SWAPS market is completely unregulated, OTC (over the counter between parties) and completely opaque. 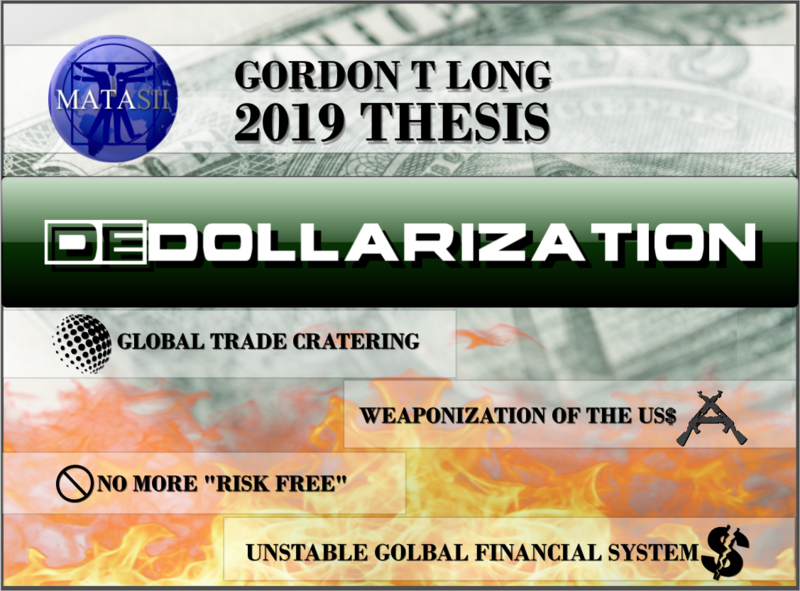 There is a lot of room for major games to be played here to control global interest rates and currency values by the major International Banks. The same banks who have been prosecuted and found guilty for fixing LIBOR, Gold prices, Money Laundering and other nefarious shenanigans. "rump change" compared to the global swaps game! Lets switch from Debt to Credit. 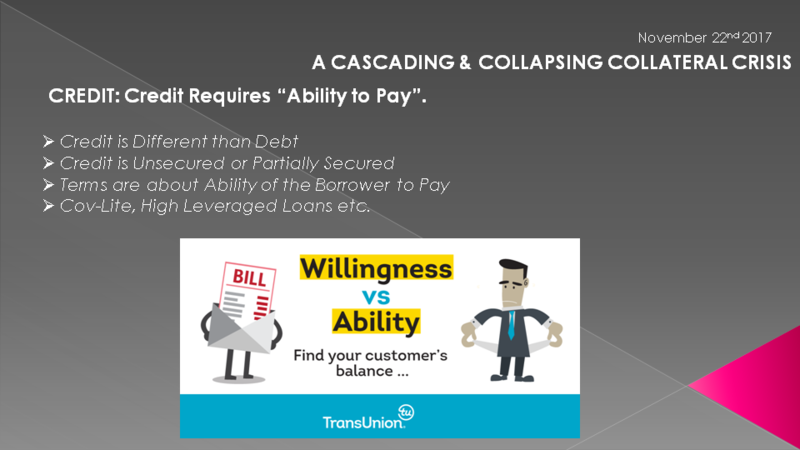 Here we switch from Collateral to Guarantees or the perceived assurances of payment. We can use the US debt as an example everyone is familiar with. We are told the US debt is approximately $20T. Most citizens are horrified with this and we hear endlessly how the government wants to reign this in, but never does. It just keeps getting bigger. The reason for this is because there is just too much money to be made lending money to an easily manipulated government and its revolving door of unaccountable elected officials desperate for campaign funding. The US debt is not $20T but in fact is closer to $84T when unfunded liabilities such as Social Security, Medicare and other entitlements are properly accounted for. Business are legally held to such practices but not the government. Unlike the private sector, the government has none of this money set aside. It has spent all the contributions made for these entitlements. How will these be funded? No one has a clue nor is presently even willing to seriously discuss it. Somehow these entitlements are going to be paid (at least to some degree) and are therefore going to require financing. That lies ahead of us and it will be interesting as an aside to see what collateral will be used for its funding? But it gets worse since the US debt is not $84T but approximates $215T. This is called the Fiscal Gap and it includes all the promises and guarantees the US government has made on the tax payers behalf. These guarantees come in various forms but are often what accountants call contingent liabilities. When the US bails out a country it doesn't actually give them money. The banks lend the money to the recipient countries (at onerous rates) but payment defaults are guaranteed by the US government. The banks can't lose as long as the US government meets its commitments. Since it perceived that the US government can print the money if it needs to, the Fiscal Gap is not accounted for as real debt. But it certainly is. The real issue is that more money in terms of lending is being created but here it is not based on collateral but the perceived ability of the government to fulfill its promises. This is what credit is. Credit is different than debt. Credit is about the lenders ability to pay or fulfill its obligation. The loan is unsecured by collateral or only partially secured. The terms are often such that it is questionable if there are any real penalties for non payment. For the banks which can conjure up loans out of the air it is only about risk. if the money is free there is little risk - as long as it can stay solvent. Now we are getting the crux of the credit problem - borrowers staying solvent. When growth slows as it does during the normal business cycle, solvency becomes a problem. As Warren Buffett often warns - "when the water goes out you find out who has been swimming naked!" 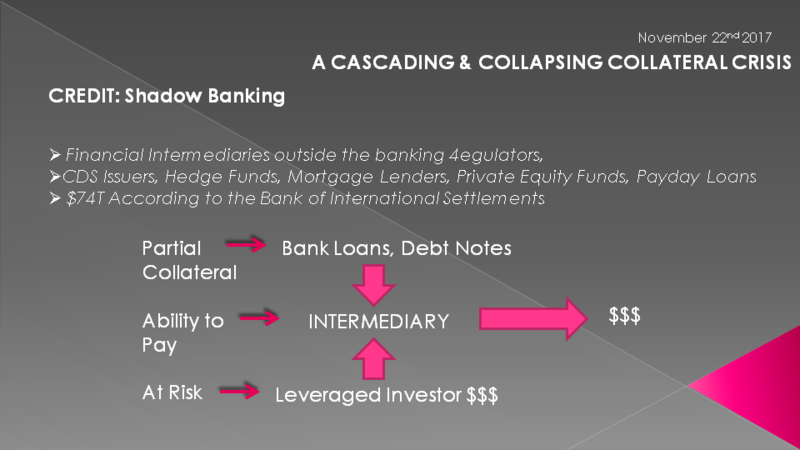 What has rapidly emerged in the Credit market is a ~$74T Shadow Banking System. 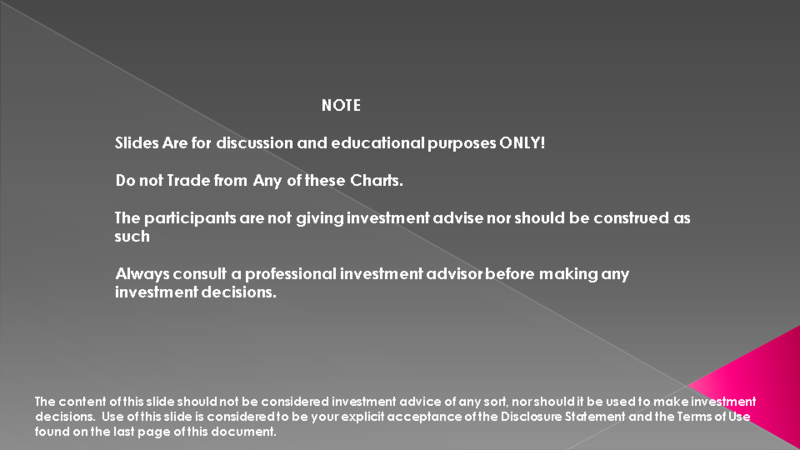 These are financial intermediaries operating outside the realm of the banking regulators. These are payers such as Credit Default Swwap issuers (we all were educated on these during the GFC), Hedge Funds, Private Equity, Mortgage Lenders right down to Payday loan outfits. These players create money in a different fashion, but nevertheless create money through credit. At approximately $74T they are now the size of the global economy. Yet another astounding fact. What this explosion in global availability of credit and growing debt obligations has done is made debt less costly and less valuable. It has also made it more risky and speculative for those doing the lending. With lending rates artificially low, for the sustained period we have had since the 2008 Financial Crisis when we fully entered the era of the Macro Prudential Policy of "Financial Repression", we have completely distorted the capital markets. With concepts such as "Novation" and "Rehypothecation" which we first identified in our 2010 "Sultans of Swaps" article series we have come to a point of completely distorting lending risk. 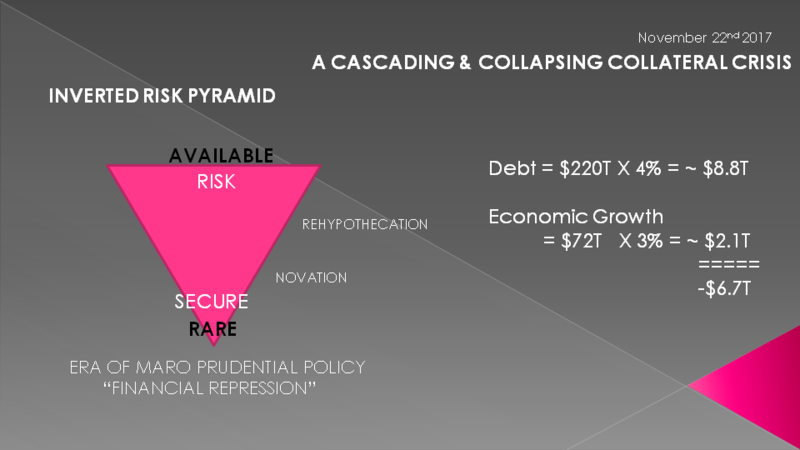 Economic growth can no longer support the debt load and is consuming investable capital and wealth creating collateral. Global debt at approximately $215T and costing in the area of 4% is consuming global economic growth. It is unsustainable. Obviously, anything that is unsustainable doesn't last. What we need to fully grasp is that debt is becoming increasingly impaired and the ability to pay debt burdens is steadily being destroyed. 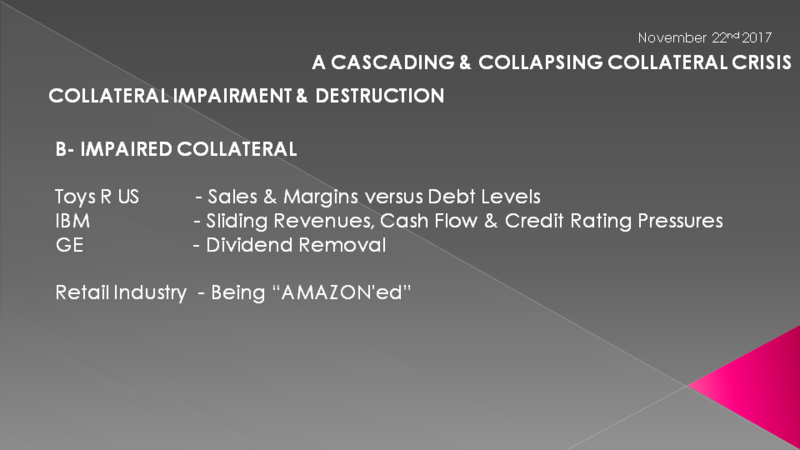 Amazon for example is a disruptive business model that both creates value but also destroys existing value through "creative destruction". It sells & distributes products far cheaper than retail stores, creating value for Amazon shareholders but concurrently destroying value for massive numbers of existing "brick and mortar" retail players who have failed to effectively embrace online retailing. For every dollar of value Amazon creates it is presently destroying 100's of dollars for existing players. 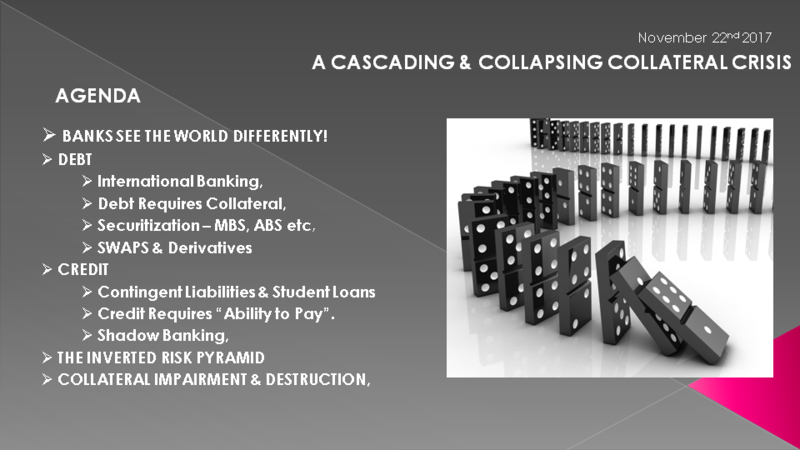 That destruction is effectively the destruction of collateral in the highly leveraged corporations of today. Like a moat around a castle, once the moat is removed, the castle is less valuable. It may actually become a liability as the Blitzkrieg in the second world war abruptly obsoleted Trench Warfare from the first WW. A disruptive technology does this. New approaches also do this. 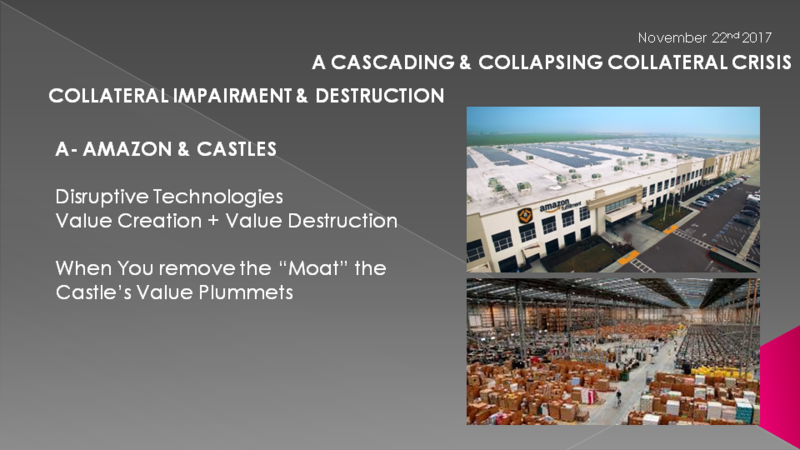 Unfortunately the collateral value of the "castle" plummets as the collateral value is seriously & hopelessly impaired. 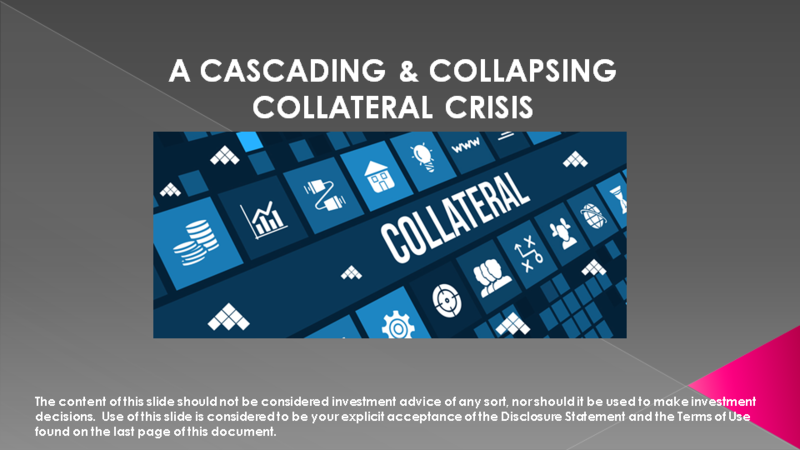 When sales fall, cashflows fall, credit ratings weaken, debt becomes more expensive and more collateral is normally demanded to support existing debt. Delinquencies and defaults often rapidly rise as companies force sales growth and therefore their debt becomes impaired. 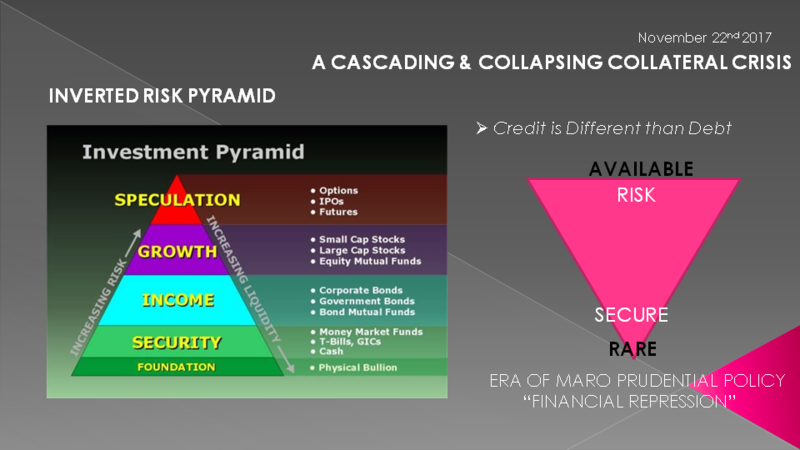 Additionally, credit & debt become harder to secure as much needed collateral becomes harder to come by. Toys R Us: Was forced into bankruptcy proceedings because its debt levels were too high for falling sales and margins to support. IBM: Years of falling quarterly top line sales have reduced cash flows and despite borrowing to support buybacks and dividends its credit rating is now exposed. Falling IBM stock value is not only bad for IBM but also investors using the stock price for margin and pledged collateral needs. GE: GE with similar problems to IBM has slashed its dividend by 50%. The enterprise value of the corporation was dramatically sliced. 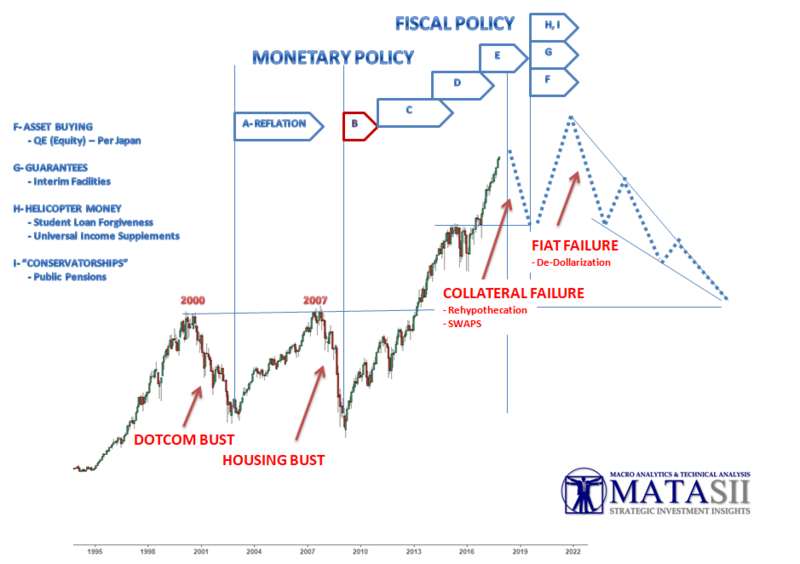 ACTIVE RISK MANAGERS (NAAIM) “GETTING OUT OF DODGE!” TAX CUT AT WRONG TIME IN BUSINESS CYCLE – LIKELY TO TRIGGER A RECESSION!